Dissertation writing is no simple feat. It’s a lengthy process that usually lasts for months. To understand how to structure a dissertation is one of the most important questions. If you know, let’s say, a 10000 word dissertation breakdown into its chapters, you’ve got a major problem solved. Dissertation writing is no simple feat. It’s a lengthy process that usually lasts for months and novice students have a lot of trouble adjusting to its many needs, some of which are unexpected. In that manner, to understand how to structure a dissertation becomes one of the most important questions. If you know, let’s say, a 10000 word dissertation breakdown into its chapters, you’ve got the first problem solved. Yes, you have. You see? Knowing your dissertation structure sorts out so many problems for you. Once you have that sorted, you can move on to focusing on what to write in each of the chapters and structure them properly without having to worry about crossing your word limit because now you know how many words go per section in the dissertation. And that’s what we’re here to do: to calculate your dissertation breakdown. Let’s begin with what the usual number of chapters is in a dissertation. Before you read the rest of this section, though, let me tell you the most important thing here is to follow your university’s/college’s guidelines. If they have given you a particular structure to follow, do exactly that. In case you’ve been thrown in the arena to battle with the dissertation dragon (that sounds so corny) without much help, you need to figure out how to overcome the beast. Out of the usual options for dissertation breakdown, a 5-chapter structure is more convenient for this discussion. I just noticed you looking suspiciously at the word convenient. Well, I didn’t mean we were going to miss anything. Of course, we can’t leave anything important undiscussed. I just don’t want to make this discussion complicated for you. 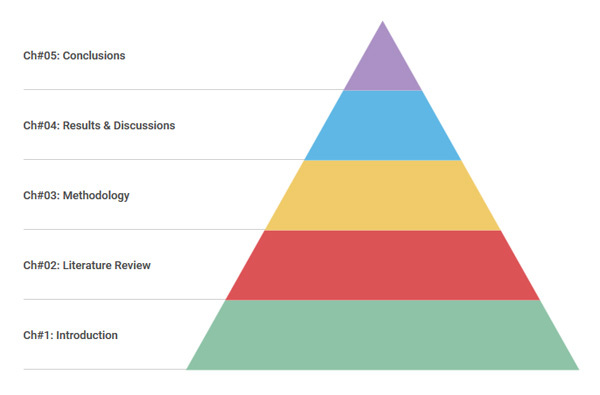 A simple 5-chapter dissertation structure. The chapters are listed in the pyramid in order of sequence. 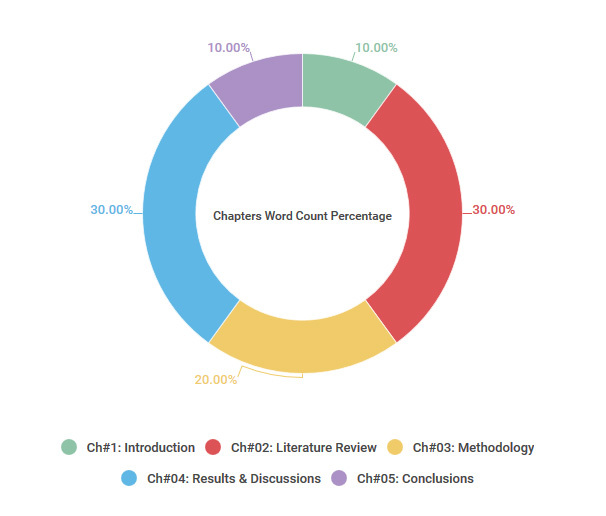 Do not think the size of a chunk is connected to the chapter’s word count percentage. Another thing you should remember about your dissertation. Or a book of interconnected essays, since every chapter is itself an essay as well. With quite a few sub-sections. So, when you’re working on your dissertation structure, remember to write it like an essay. How Many Words Go Per Section in My Dissertation? It’s all about the ratio. Each chapter of the dissertation is expected to have a particular chunk of the report in terms of the number of words allowed. Let me give you the percentage ratio I use for calculating each chapter’s word count for our customers at Dissertation Sage. I’ll be using a 10000 word dissertation breakdown for simpler calculations. NOTE: This is a tentative dissertation breakdown. Some university guidelines will ask for a different number of words for a chapter and some other places will ask for a different set of chapter titles. So, again, stick to your university’s given guidelines. What I have done here is a convenient breakdown for you to understand how much of your dissertation’s word count should go into its main sections. Now that you know what percentage of words goes into which section of your dissertation, you can easily calculate your dissertation breakdown on your own. But we’ll make it even easier. You don’t have to leave this page without getting the actual numbers for your dissertation chapters, and it doesn’t matter whether it’s a 10000 word dissertation or a 12000 word dissertation breakdown (or more) because it’s the ratio that matters. Here’s your dissertation breakdown calculator. Just put in your total word count and the calculator will give you the numbers in a tick. Let me know what you think about this post in the comments section below and don’t hesitate to share any questions you might have.